The Shrek spin-off, Puss in Boots again features the voice of Antonio Banderas (You Will Meet a Tall Dark Stranger) as the sword-fighting feline. The animated movie tells the story of Puss in Boots years before he met Shrek and Donkey. Puss is a wanted fugitive trying to clear his name. Puss finds his female match in Kitty Softpaws (Salma Hayek, Frida), who takes Puss to his old friend but now enemy Humpty Dumpty (Zach Galifianakis, It’s Kind of a Funny Story). 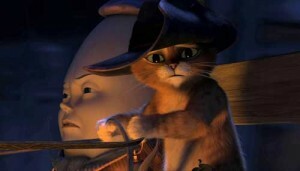 Together with Humpty and Kitty, Puss plans to steal the beans, get to the Giant’s castle, grab the golden goose and clear his own name. But along the way, they have to face-off with infamous criminals Jack (Billy Bob Thornton, Armageddon) and Jill (Amy Sedaris, Chicken Little). Puss in Boots also features the voice of renowned movie director Guillermo del Toro (Mimic). The Blu-ray is a Blu-ray/DVD Combo and the Blu-ray 3D version is a Blu-ray 3D/Blu-ray/DVD Combo pack. Both include a downloadable digital copy of the film. Like Paramount’s release of Shrek Forever After and How to Train Your Dragon, Puss in Boots comes in the DVD Double-Pack with a new adventure. 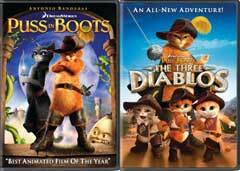 In “Three Diablos,” Puss in Boots is at a crossroads between two destinies: hero and outlaw. A princess hires Puss to get back her stolen ruby from the notorious French thief The Whisperer and he’s reluctantly partnered with three little kittens, Adorable, Fuzzy and Deadly. The Three Diablos quickly wreak havoc on Puss’ mission. The “Three Diablos” short film also is included in the Blu-ray and Blu-ray 3D combo packs. The movie also is available in single Blu-ray and DVD versions.